No trip to Peru is complete without experiencing the ancient Nazca Lines, the animal paradise of the Ballestas Islands and the natural oasis of Huacachina. You can discover the prehistoric phenomenon of the Nazca Lines, be among islands teeming with seals, sea lions and other wildlife, then sand board down oasis dunes on a short Cultural Immersion tour from Lima. Get the best of culture, nature, history and adventure in only 3 days on a tour that you will never forget! 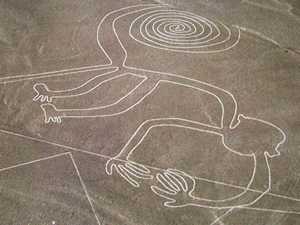 The Nazca Lines, created during 200BC to 500AD, are particularly appealing due to their magnificent and unique artistic formations that had such great dimensions and diversity, that they were unrivalled in comparison to anywhere else in the prehistoric world. They consist of over 100 geoglyphs designed to represent living creatures including, the human, bird, spider, monkey, killer whales and the largest of all, the pelican spanning 285m (935ft). Other depictions include flowers, plants, trees and objects such as looms. There are also geoglyphs of abstract designs including straight lines spanning some several kilometers, crisscross patterns, and shapes including triangles, spirals and rectangles. The geoglyphs are located 400km (248m) south of Lima in the arid plain of the Peruvian coastline and are very impressive as they cover approximately 450km2 (280m2) over the desert and low Andean foothills. The historical intrigue of the lines and what continues to draw archeologists, ethnologists and anthropologists from all over the world is the remaining enigma of the original purpose for creating the Nazca Lines and geoglyphs. There have been many theories such as, they were created for religious purposes so they could be seen by the Gods, they were used as an astrological and meteorological observatory, they were created to represent constellations, or they were used during religious practices to worship deities who influenced water supply and thereby the success of crop production. However, none of these theories have been substantiated and continue to intrigue historians and travelers alike. 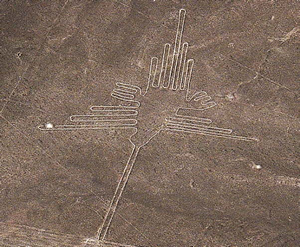 The lines can be seen in full and appreciated from the sky on a Cultural Immersion private tour. You will be taken by your private guide to the Nazca Airport where you will board your 30 minute flight over the incredible Nazca Lines. During the flight you will be able to see the most important figures such as: the monkey, hummingbird, tree, parrot, astronaut, dog, condor among others. This tour really is a special opportunity to see the beauty and uniqueness of these amazing prehistoric artistic designs. 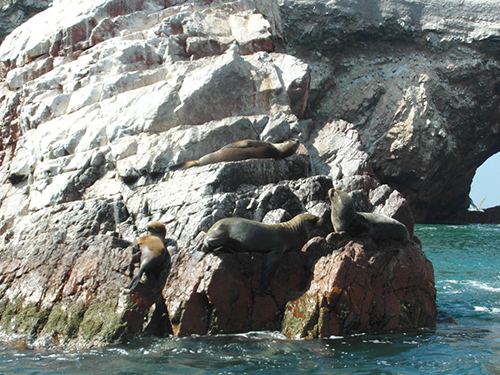 To make your time in this part of Peru truly memorable, animal lovers should not miss the Ballestas Islands off the coastal town of Paracas. These small islands have even been compared to the Galapagos due to the huge number of animals that inhabit the area. The shores are teeming with noisy and playful seals and sea lions plus there are over 150 different species of birds including, the Humboldt penguin, cormorants, boobies and pelicans. This is a place where you will be surrounded by a magnificent flurry of wild sea life that you will cherish forever. For only one extra day, you can include these islands on your private Cultural Immersion tour to Nazca. You will be taken by private transport to the bay of Paracas where you will embark on a short boat ride to the Ballestas Islands. On the way, you will see another geoglyph ‘Candelabro’ as it appears in the shape of a candle-holder. When you arrive to the Ballestas Islands your senses will be overwhelmed by the bustle of birds and sea life. You will cruise around the islands, close enough to get a great look at all the animals and appreciate the caves and interesting rock formations on the islands. You will see seals on the shore and swimming around the boat. No boats are permitted to land on the islands due to protection regulations; however, in the boat you will definitely feel among all the action! Another great optional destination within this region of Peru is the stunning natural oasis of Huacachina. If you love fascinating landscapes, this is the place for you! On a Cultural Immersion tour you will unexpectedly stumble upon a beautiful palm-lined oasis surrounded by high pristine sand dunes. Here, you can choose to explore the oasis on foot, or the more adventurous can take an exhilarating sand buggy ride through the dunes and maybe even try sand boarding down the beautiful dune slopes. This region of Peru is definitely not to be missed !! !